Dave Grohl and his men take a musical tour of the US and come up with songs that reflect a nation. 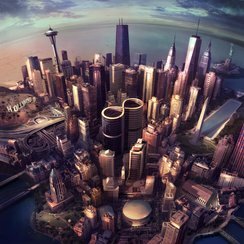 For their eighth studio album, Dave Grohl has taken Foo Fighters out onto the streets of America. Over the course of several months, the band has soaked up influences, got a feeling for the local culture and written and recorded songs that reflected eight major cities: Austin, Chicago, Los Angeles, Nashville, New Orleans, New York, Seattle and Washington DC. Grohl explained to Radio X that bands are the product of their environment, particularly the classic UK groups he group up loving: "If you think about Birmingham, everyone’s like 'Oh, it’s an industrial city’ and then you get Black Sabbath. I don’t know if Black Sabbath could have come from anywhere else. It makes sense that this band comes from that place." But those expecting a musical travelogue pulling in styles from around the country, don't panic. This is still a Foo Fighters record that embraces the slick blend of post-grunge anthems and classic 70s rock that Grohl has been employing since 1995's self-titled debut. The first taster, Something From Nothing, opens the album with an assured air and plenty of patented Foos riffage. And these are BIG songs, which the finale, I Am A River, clocking in at over seven minutes.